The painting will be officially unveiled at a NOSA event just prior to the 69th annual N2E race that starts off the Balboa Pier on April 22. Boller said NOSA Commodore David Shockley’s directives for the annual piece of art – a tradition of the organization since the 1960s – was to create an image depicting an abundance of effort and energy, the strong wills of participating sailors and be a tribute to the event’s relationship with Mexico. 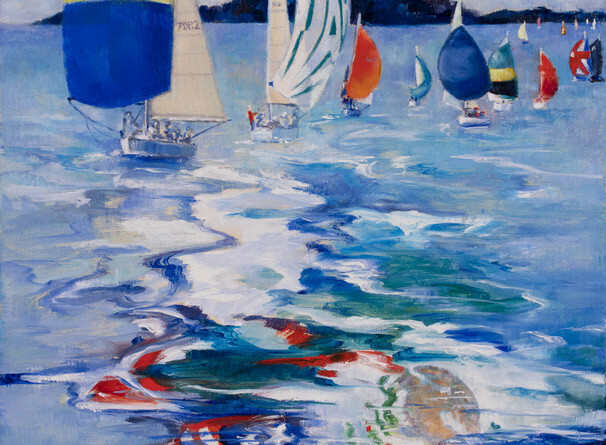 Complementing sailing and the story of the race, the finished work depicts the dawn following an all-night sail, showing countless boats with spinnakers up along the final stretch. In the foreground is a subtle illusion of the American and Mexican flags waving in the water fractals. Images of the painting will be used on the cover of the event program, on select promotional materials and on racewear to be sold online and at pre-race parties. Following the race, board members decide the painting’s destiny. The works of art have been donated to charity, gifted to the local mayor, auctioned for charity or bequeathed to the commodore as a thank you. Boller, a highly accomplished local artist and sailor also created the 2007 painting for NOSA. She even raced that year. For a while, her Islander 32 served as a studio, where she used its mainsail as a canvas. For details about the 2016 artwork or race, visit newporttoensenada.com.